Chelsea among favourites to sign Barcelona playmaker? Chelsea among favourites to land Coutinho? 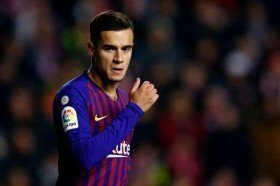 Chelsea and Paris Saint-Germain are regarded as among the favourites to lure Philippe Coutinho from Barcelona when the current season comes to a close. The 26-year-old joined the Blaugrana from Liverpool in the winter of 2018 and he has since notched 19 goals in 64 appearances for the La Liga holders across all competitions. Despite this, his future has remained a regular concern with manager Ernesto Valverde opting to regularly rotate him alongside Ousmane Dembele and Sport claims he could move on from the Catalan giants. As per the Spanish outlet, both Les Parisiens and Blues are hot on the trail for the former Liverpool man and the latter consider him as a potential replacement for Eden Hazard, who has been strongly linked with Real Madrid. Chelsea are presently banned from signing players for the next two transfer windows, but they remain hopeful of delaying the embargo for at least the summer through appeals to either FIFA or the Court of Arbitration for Sport.